I chose to study a Masters degree in Oceanography because of my passion for science and my desire to use scientific knowledge to tackle global issues such as climate change and sustainable development. Having grown up by the sea in Southampton, I have always been tremendously curious about the wonders and mysteries of the ocean. I chose to undertake the Masters programme offered at the University of Southampton, National Oceanography Centre (NOCS) because of its reputation for excellence and cutting edge research in the field. Studying at NOCS was an enriching experience – I had access to and interactions with some of the leading professionals in the field of Oceanography, encompassing all disciplines from geophysics to marine biology. This provided a vast array of choice for further studies and for future career options. This was coupled with a team of staff dedicated to providing a Masters programme of high quality and academic integrity, whilst always aiming to make improvements and adjustments based on student needs and feedback. One of the best things about the Masters programme was their commitment to the future careers of the students enrolled in the programme. This commitment allowed me to take a position working as a researcher onboard The Scholar Ship for their inaugural voyage in September 2007 and again in January 2008. The Scholar Ship is an academic program aboard a transformed passenger ship hosting students from around the world on semester-long (16 week) voyages around the world. I was employed by The Scholar Ship Research Institute to co-ordinate the onboard research activities in Oceanography and Atmospheric Science. The onboard research activities take advantage of the unique opportunity to gather scientific data across the oceans and seas in which it travels, some places which have never before been sampled or are under-sampled due to the high expense associated with chartering dedicated research vessels. 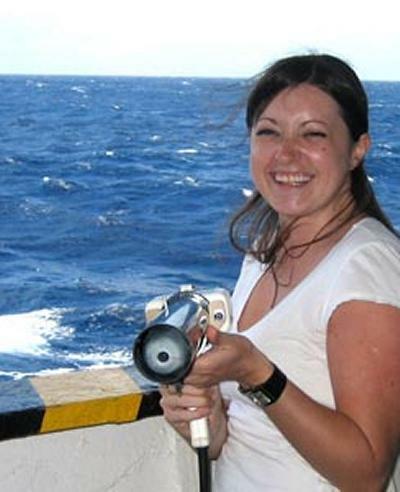 My role presented a unique challenge in setting up, conducting and managing a research programme onboard a passenger ship and required me to oversee and implement oceanography and atmospheric science research.